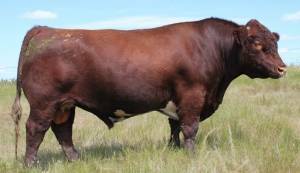 Jaxson is a very docile, deep ribbed bull with a big rear quarter and is out of a easy keeping, capacious Bonanza 219M cow. Ultrasound data showed that Jaxson was one of the highest indexing bulls in the pen for both marbling and REA. He's in the top 30% for growth and top 20% for low BW EPDs. THF, PHAF, DSF.